Eating and trying different foods is one of my favorite things to do when I jet set to a different destination. 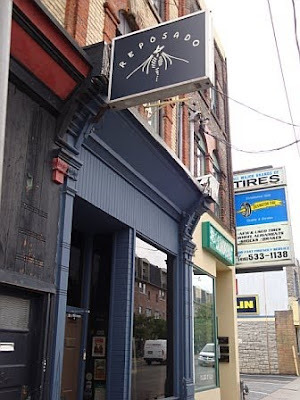 I just got back from a trip to Toronto, Canada, and took pictures of almost all of the places we stopped into for a bite to eat. Whether it was just a snack, a drink, or a meal, I kept notes so that I could share it with all of you. 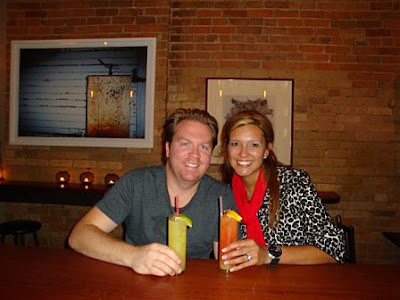 So consider this article your "Eating Your Way Through Toronto Guide." If you ever happen to jet set to Toronto in the future, feel free to print this and take this along with you so you can eat and be merry! 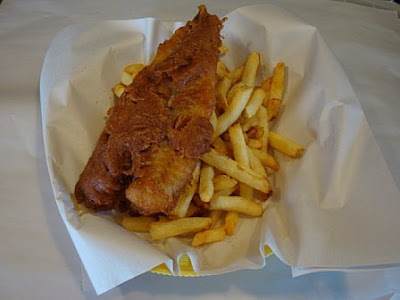 For around $10 U.S., you get a nice helping of fish & chips. We went for the Haddock and fries. I have to say it was delicious! What really impressed me was the fact that the fish is fresh- not frozen- and when you order french fries, they are literally cut right in front of you and cooked before your eyes, so you know they haven't been sitting around all day. The one thing I was disappointed in about this place was that their tartar sauce came out of a package. You would think if they go through all of that trouble for their fish and fries, that they would equally do the same for their sauce and make it homemade. 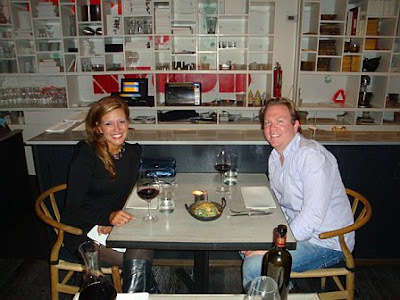 But, the good news is is that the food was so good that you didn't even need the tartar sauce. 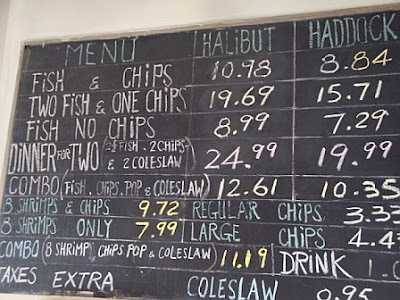 One place that we didn't get to try, but that we heard is also good for fish & chips is Chippy's: 893 Queen Street West (416) 866-7474. 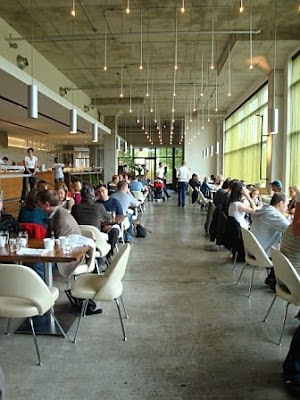 This is a really chic and trendy little hot spot. They serve Mediterreanean food in a "tapas style" menu. They have an open-style kitchen, so literally the chef prepares your food right in front of you. The dishes are creative and presented really nicely. We had their Soft Shell Crab Salad with yuzu, watercress & coriander ($18), Mushroom Flatbread with gorgonzola, cremini, king oyster & lemon thyme ($18), Chimichurri Tiger Shrimp with crispy lentil, smoked tomato, and spiced honey ($17), Panko Crusted Chicken with radicchio, pear and key lime ($16), and the Malta Braised Short Ribs with spice crunch ($14). Everything was amazing! 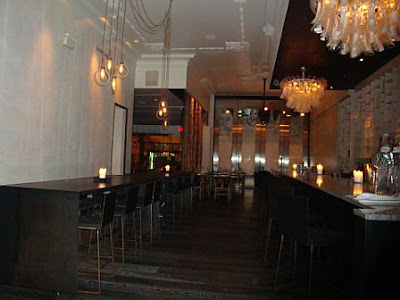 The owners of this restaurant also own a place called Kultura: 169 King East (416) 363-9000 which we heard is equally as good. This place seems to be open all day. 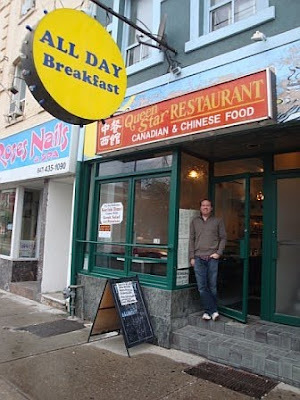 It's your typical greasy spoon spot where you can get a yummy breakfast of eggs & bacon or good Chinese food for lunch or dinner. 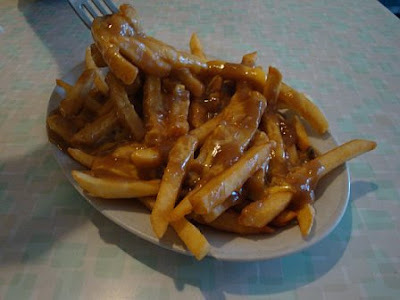 Or it's also a good place for Poutine ($5)- The French Canadian dish of french fries with cheese curds & gravy...Heaven! Poutine seemed to be sold at many different places around Toronto- so we knew it was a must try. 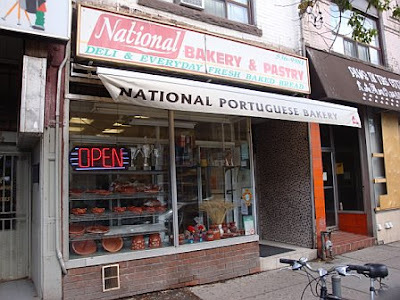 Toronto has an area known as Little Portugal. 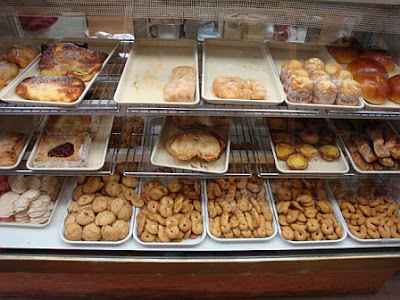 We knew we had to stop at a Portuguese Bakery and have some coffee and Pasteis de Nata or Portuguese Custard Tarts. 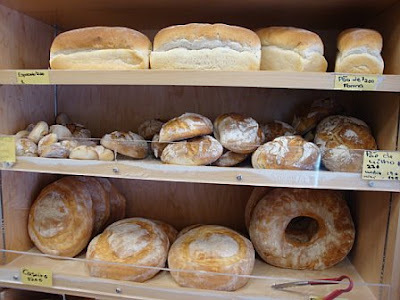 They also have a great selection of Portuguese rolls & breads...this place is totally authentic and worth the calories! Reposado is an awesome Tequila Bar. We had Margaritas: The Original Reposado Margarita ($9), The Blood Orange Margarita ($9.50) & The Mango Margarita ($9.50)...all were so yummy! Their Breakfast On The Go Sandwich ($6.95) is worth staying at the cafe for. 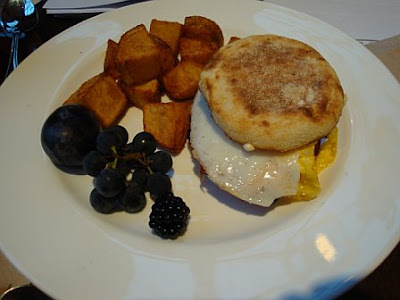 It has eggs over medium, grilled peameal bacon, cheddar, tomato & chipotole mayo on a toasted english muffin. 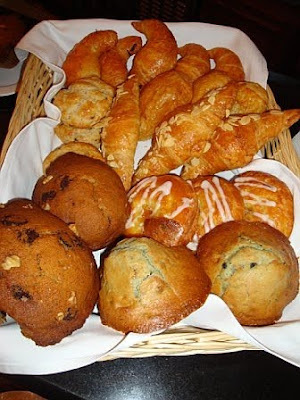 They also have House-Made Baked Goods. Their chocolate-banana-walnut muffin is definitely worth ordering ($1.77) as is their cinammon-raisin scone ($1.99)! 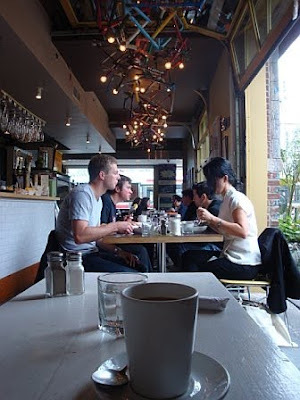 Wash it all down with one of their Lattes ($3.53)...which was voted best Latte in Toronto by The Economist! 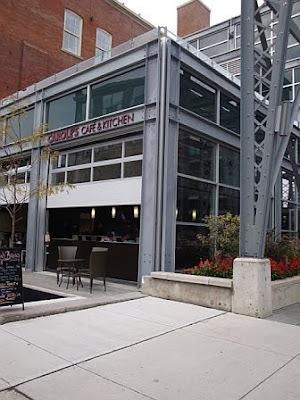 (7) Carole's Cafe & Kitchen: 109 Atlantic Avenue (416) 536-1347. This place serves brunch, but is better known for it's wide array of cheesecakes. You name a flavor and it's probably on the menu from plain to pumpkin. 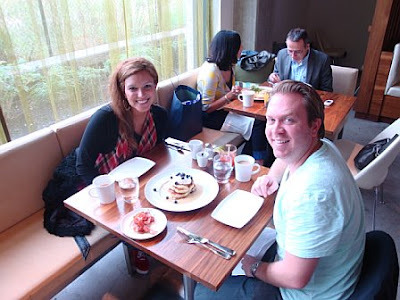 This place does an AMAZING Sunday brunch...and considering brunch is such a big deal in Toronto...this was a must try for us. 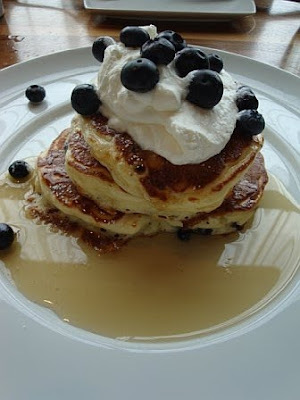 We had their Mrs. Biederhof's Pancakes ($12)- The BEST blueberry buttermilk pancakes with Lanark County maple syrup & whipped cream. We also had their Huevos Monty ($13)- black bean refritos, sharp cheddar baked in flour tortillas, eggs sunny, salsa & avocado creme fraiche, and we had their Chef's savory tart with salad ($12)- the choice changes every week. 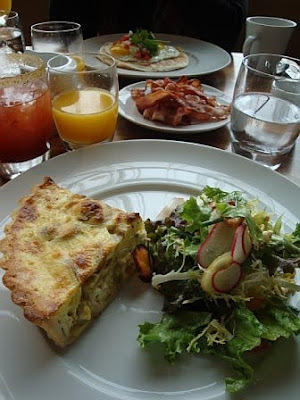 When we went, their tart was made with fingerling potatoes, goat cheese, onions & herbs. 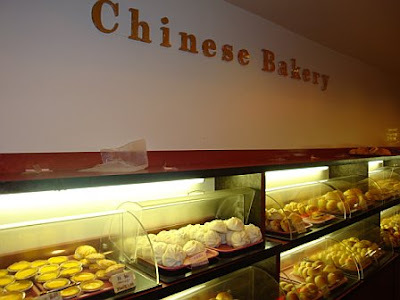 (9) Chinese Bakery: Just wander through Chinatown and you are bound to find this place! 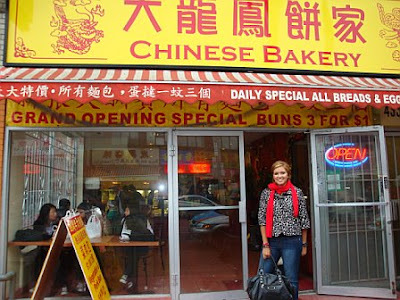 It has everything from Chinese steamed buns, to butter rolls, pork buns and everything in between. 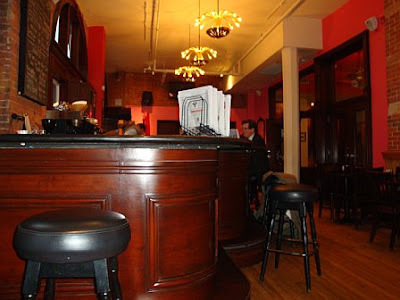 It's a great place to stop in for a quick bite as you are touring the city. The buns are 3 for $1...so go ahead and help yourself! 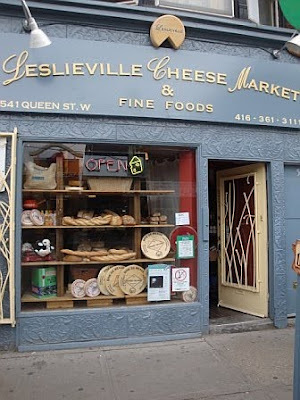 (10) Leslieville Cheese Market: 541 Queen Street West (416) 361-3111. This place has great cheese and breads. 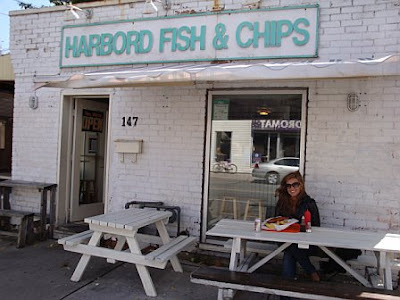 Stop in here before you head to Toronto Islands and pick up a basket of stuff to have a nice picnic. We had their Earl Grey Iced tea with lemon which is brewed fresh and sweetened...it was delish! (11) Tim Hortons: THEY ARE EVERYWHERE! This is a coffee & donut chain (like our version of Dunkin Donuts in the U.S.) which started in Ontario, Canada. It's known for its Apple Fritter & The Dutchie donut. We had their Maple Glazed- which is basically a Boston Creme donut with maple glaze instead of chocolate...Oh My Gosh...I could have eaten a dozen by myself they were so good! Their coffee is pretty good too! 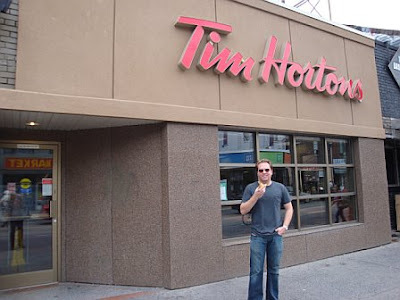 They do now have Tim Hortons in the U.S., including 11 locations in NYC! 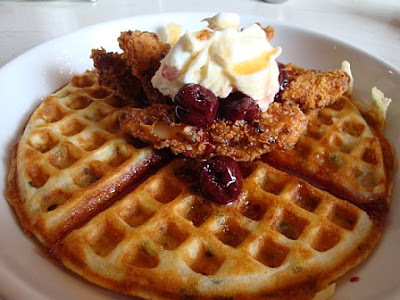 We had their: Southern Fried Chicken & Waffles ($14)- Herbed waffles, BBQ Fried Chicken, Maple Syrup & Sweet Niagara Cherry Jam...to die for! 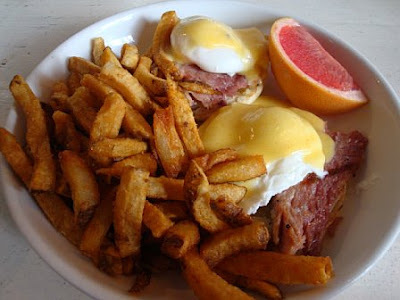 And their Eggs Benedict ($14)- 2 Poached Eggs, House Smoked Pork Loin, Toasted English Muffin, Hollandaise & BBQ French Fries...you must get this one too! 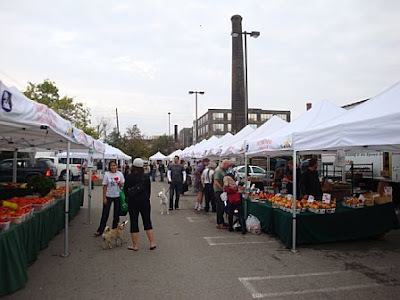 (13) Liberty Farmer's Market (Every Sunday 9am-2pm): Fresh local Canadian vegetables & fruits, along with tasty breads & pastries.